God's Not Dead is a 2014 American Christian drama film directed by Harold Cronk and starring Kevin Sorbo, Shane Harper, David A. R. White, and Dean Cain. The film was released theatrically on March 21, 2014 by Pure Flix Entertainment. Written by Cary Solomon and Chuck Konzelman, and based on Rice Broocks' book God's Not Dead: Evidence for God in an Age of Uncertainty, the film follows a Christian college student (Harper) whose faith is challenged by a philosophy professor (Sorbo) who declares God a pre-scientific fiction. It received mostly negative reviews, but grossed over $62 million on a $2 million budget. The film is followed by the 2016 film God's Not Dead 2 and the 2018 film God's Not Dead: A Light in Darkness. Josh Wheaton, an evangelical college student, enrolls in a philosophy class taught by Professor Jeffrey Radisson, an atheist, who demands his students sign a declaration that "God is dead" to pass. Josh is the only student who refuses to sign. Radisson requires Josh to debate the topic with him but agrees to let the class members decide the winner. Josh's girlfriend Kara demands Josh either sign the statement "God is dead" or drop Radisson's class, because standing up to Radisson will jeopardize their academic future. Kara breaks up with Josh for insisting on confessing his belief in God. Radisson gives Josh twenty minutes at the end of the first three lecture sessions to argue that God exists. In the first session, Josh presents his evidence that God created the universe. In the second session, Josh argues that macroevolution is not as solid a theory as it is usually presented. In the first two sessions, Radisson has counter-arguments for some of Josh's points. Ultimately, it comes down to the third and final debate between Radisson and Josh, who again both make compelling points. Josh then halts his line of debate to pose a question to Radisson: "Why do you hate God?" After Josh repeats the question twice more, Radisson explodes in rage, confirming he hates God for his mother's death that left him alone despite his prayers. Josh then casually asks Radisson how he can hate someone that does not exist. In the end, Martin, a student from China whose father had forbidden him from even talking about God to avoid jeopardizing Martin's brother's chance at overseas study, stands up and says, "God's not dead." Almost the entire class follows Martin's lead, and Radisson leaves the room in defeat. Radisson dates Mina, an evangelical whom he belittles in front of his fellow atheist colleagues. Her brother Mark, a successful businessman and atheist, refuses to visit their mother, who suffers from dementia. Mark's girlfriend Amy is a left-wing blogger who writes articles critical of Duck Dynasty. When she is diagnosed with cancer, Mark dumps her. A Muslim student named Ayisha secretly converts to Christianity and is disowned by her infuriated father when he finds out. After the final debate, Josh invites Martin to attend a concert by Christian pop rock group the Newsboys. Radisson reads a letter from his late mother, and is moved to reconcile with Mina. Amy confronts the Newsboys in their dressing room, only to ask them to help guide her in converting to Christianity. While on his way to find Mina, Radisson is struck by a car and fatally injured. Reverend Dave, who is waiting at the intersection, tends to Radisson and helps him become a Christian as he dies. The film's main characters all convene at the Newsboys concert, where they play a video clip of Willie Robertson congratulating Josh. The Newsboys play their song "God's Not Dead", dedicating it to Josh. The film was shot from October to November 2012, in Baton Rouge, Louisiana, with the concert scene done in Houston, Texas. the inspiration behind the setting of the movie dates back a few years ago. I was in a meeting at Pinnacle Forum and Alan Sears from Alliance Defending Freedom, was speaking. He was speaking about a young girl who was asked to do some things that went against her faith and got in trouble for not doing them. That story put my jaw on the floor and made me think about how many students go to college as a Christian and how few stay a Christian after they finish their four years. It was that story that inspired me to set the movie on a college campus. The film soundtrack was released on March 3, 2014, by Inpop Records. The film became a surprise success at the box office. In its first weekend of release, the film earned $8.6 million from 780 theaters, causing Entertainment Weekly's Adam Markovitz to refer to it as "the biggest surprise of the weekend". During that week, it finished third behind Divergent and Muppets Most Wanted in the box office, with $9.2 million. The film began its international roll out in Mexico on April 4, 2014, where the movie grossed $89,021 its opening weekend. God's Not Dead grossed $60.8 million in North America and $3.9 million in other territories for a total of $64.7 million, against a budget of $2 million. At the end of 2014, God's Not Dead was ranked 93rd in terms of worldwide gross, and finished with $64.7 million worldwide. On Rotten Tomatoes the film received a rating of 14%, based on 22 reviews, with an average rating of 2.7/10. On Metacritic, the film received a score of 16 out of 100, based on six critics, indicating "overwhelming dislike". Writing for The A.V. Club, Todd Van Der Werff gave the film a "D–," saying, "Even by the rather lax standards of the Christian film industry, God's Not Dead is a disaster. It's an uninspired amble past a variety of Christian-email-forward bogeymen that feels far too long at just 113 minutes". Reviewer Scott Foundas of Variety wrote "... even grading on a generous curve, this strident melodrama about the insidious efforts of America's university system to silence true believers on campus is about as subtle as a stack of Bibles falling on your head ..." Some sources and blogs have cited the film's similarities to a popular urban legend. The basic premise of an evangelical student debating with an atheist professor and winning in front of the class (who then applauds) has been the subject of a popular Chick tract. The Alliance Defending Freedom, American Heritage Girls, Faith Driven Consumer, Denison Forum on Truth and Culture, Trevecca Nazarene University, The Dove Foundation and Ratio Christi have all endorsed the film. On the other hand, the young Earth creationist apologetics ministry, Answers in Genesis, would not endorse the film because of the promotion of several elements which they deemed to be "unbiblical". Dave Hartline of The American Catholic gave God's Not Dead a positive review and hoped that other films like it will follow. Vincent Funaro of The Christian Post praised the film for being "a hit for believers and may even appeal to skeptics searching for answers." Evangelical Michael Gerson, however, was highly critical of the film and its message, writing "The main problem with God's Not Dead is not its cosmology or ethics but its anthropology. It assumes that human beings are made out of cardboard. Academics are arrogant and cruel. Liberal bloggers are preening and snarky. Unbelievers disbelieve because of personal demons. It is characterization by caricature." John Mulderig echoed similar concerns in his review for the Catholic News Service, stating: "There might be the kernel of an intriguing documentary buried within director Harold Cronk's stacked-deck drama, given the extent of real-life academic hostility toward religion. But even faith-filled moviegoers will sense the claustrophobia of the echo chamber within which this largely unrealistic picture unfolds." Writing for Christian Reviews, Roger Patterson of Answers in Genesis gave the film 3.5/5 stars and noted that "clichés die hard", but concluded that "an astute and mature Christian can use the film as a teaching opportunity". Pure Flix Entertainment produced a sequel, God's Not Dead 2, with a release date of April 1, 2016, several days after Easter. A third God's Not Dead film, God's Not Dead: A Light in Darkness, was released on March 30, 2018. ^ "God's Not Dead (PG)". British Board of Film Classification. April 7, 2014. Retrieved April 8, 2014. ^ Busch, Anita (April 3, 2014). "'God's Not Dead's Kevin Sorbo Takes Hollywood & Media To Task As He Backs Crowdfunding Campaign For Telefilm On Convicted Abortion Doctor Kermit Gosnell". Deadline Hollywood. Retrieved April 5, 2014. ^ a b c "God's Not Dead (2014)". Box Office Mojo. Amazon.com. Retrieved August 14, 2014. ^ Farber, Stephen (March 21, 2014). "God's Not Dead: Film Review". The Hollywood Reporter. Retrieved April 26, 2014. ^ "GOD'S NOT DEAD - Synopsis". godsnotdeadthemovie.com. Milk Money Promotions. Archived from the original on July 29, 2015. Retrieved July 12, 2015. ^ Schoen, Taylor (November 12, 2012). "Christian movie filming on campus". The Daily Reveille. Baton Rouge, Louisiana: Louisiana State University. Retrieved August 30, 2013. ^ "Exclusive Interview With Pure Flix Entertainment for God's Not Dead Movie". Alliance Defending Freedom. February 14, 2014. Archived from the original on April 7, 2014. Retrieved April 2, 2014. ^ "God's Not Dead (The Motion Picture Soundtrack)". iTunes. Retrieved December 5, 2016. ^ Highfill, Samantha (March 23, 2014). "Box office report: 'Divergent' heads straight for $56 million win | Inside Movies | EW.com". Insidemovies.ew.com. Retrieved April 26, 2014. ^ Brevet, Brad. "Weekend Box Office: Breaking Down 'Divergent' at #1, 'Muppets 2' is Weak & 'God's Not Dead' Surprises". ComingSoon.net. Retrieved March 23, 2014. ^ "2014 Worldwide Grosses". Box Office Mojo. 2014. 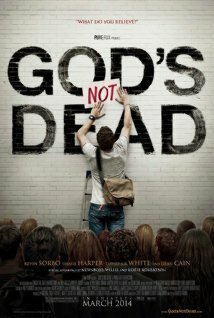 ^ "God's Not Dead". Retrieved February 15, 2019. ^ "God's Not Dead Reviews". Metacritic. Retrieved October 12, 2014. ^ Van Der Werff, Todd (March 24, 2014). "God's Not Dead is a mess even by Christian film standards". The A.V. Club. Retrieved April 26, 2014. ^ Foundas, Scott (March 22, 2014). "'God's Not Dead' Review: A Ham-Fisted Christian Melodrama". Variety. Retrieved April 26, 2014. ^ Seemayer, Zach (March 30, 2014). "'Noah' Washes Away Competition At The Box Office". ETonline.com. ^ a b Noble, Alan (October 25, 2013). ""God's Not Dead," But this Trope Is". Patheos. ^ Mehta, Hemant (September 10, 2013). "If an anti-atheist story on Snopes were made into a film, it'd be this one". Patheos. ^ "God's Not Dead – Endorsements". Pure Flix Entertainment. Retrieved April 1, 2014. ^ Patterson, Roger (February 25, 2014). "God's Not Dead Movie Review". Answers in Genesis. Retrieved August 30, 2014. ^ "God's not dead; There's something happening here". American Catholic. Retrieved April 2, 2014. Slowly but surely with movies like God's Not Dead, others will follow, and the old secular guard will not like it and force us to endure some trials and tribulations. ^ Funaro, Vincent. "'God's Not Dead' Review: Encouragement for Believers Facing Secular Hostility". The Christian Post. Retrieved August 5, 2014. ^ Gerson, Michael (March 21, 2014). "Michael Gerson: 'Noah,' 'God's Not Dead' are movies lacking grace – The Washington Post". The Washington Post. The Washington Post. Retrieved April 2, 2014. ^ Mulderig, John. "God's Not Dead". Catholic News Service. Retrieved April 2, 2014. ^ Patterson, Roger. "God's Not Dead (2014)". Christian Reviews. Retrieved January 14, 2018. ^ "'God's Not Dead 2' Getting Ready to Rock Atheists' World". Charisma News. October 22, 2014. Retrieved July 12, 2015. ^ Endriga, Jomar (October 17, 2015). "God's Not Dead 2 Teaser Trailer Released in Time for Woodlawn Movie; NFL Star Tim Tebow Comments on Woodlawn Sneak Peek". The Gospel Herald. Retrieved October 19, 2015. ^ "God's Not Dead 2: Coming April 1, 2016". God's Not Dead Blog. August 25, 2015. Retrieved October 19, 2015. ^ Morefield, Kenneth R. (July 8, 2015). "Pureflix Sets Release Date for God's Not Dead 2: He is Surely Alive". 1More Film Blog. Retrieved October 19, 2015. ^ God's Not Dead: A Light in Darkness (2018) at Rotten Tomatoes. Retrieved January 14, 2018. "You Are My King (Amazing Love)"
"God's Not Dead (Like a Lion)"
This page was last edited on 12 April 2019, at 03:36 (UTC).